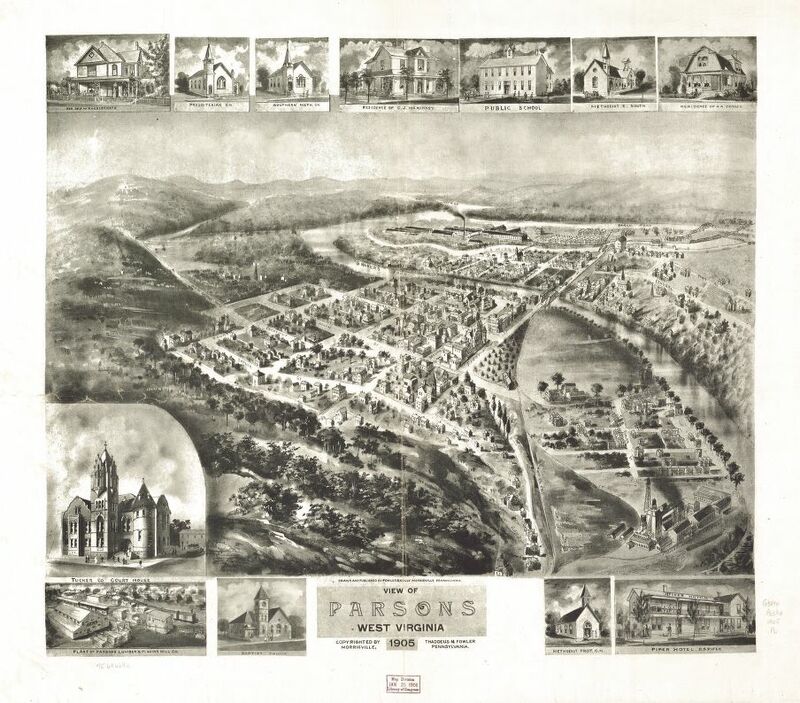 “Parsons, the seat of Tucker County, boomed as a lumber town in the 1880s; when the boom subsided, tanneries and woolen mills were established. St. George was the seat of Tucker County until 1893 when it was supplanted by Parsons. The removal was accomplished by an armed guard without bloodshed, although plans had been made by men of St. George to defend the county records with their lives.”- West Virginia Writers’ Project. When the West Virginia Writers’ Project wrote this during the Great Depression, Parsons had a population of 1,649. It now has a population of 1,485. In 1985, Parsons was nearly devastated by flood along Cheat River. Many testify to their experiences during this flood as proof that some of the kindest people live in Parsons. Located on the National Register of Historic Places is the stunning red brick courthouse and jail, built in 1898, located along US 219 in downtown Parsons. –Listen to the story about Doyle Oliver Kisner in Parsons. Doyle is a clockmaker, and at the age of 90, a lifelong resident of the once-booming railway town in the heart of Tucker County. “Right from Parsons on State 72, concrete-paved, to St. George, 6.5 m. (1,553 alt., 200 pop. ), the site of a fort built in 1772 by John Minear and others. They abandoned it in 1774 because of Indian attacks, but returned two years later to settle permanently.” – WV Writers’ Project. Parsons, 1905. From the Library of Congress. To find out more about traveling to Parsons and nearby attractions, including skiing, canoeing, kayaking, white water rafting, visiting Canaan Valley Resort or Blackwater Falls, contact the Tucker County Convention and Visitors Bureau (1-800-782-2775), located in Davis. Sources: Smith, Mariwyn McClain “Parsons.” e-WV: The West Virginia Encyclopedia. 22 October 2010. Web.